Abstract: A 12-year-old miniature dachshund experiences chronic episodes of pain due to both a lumbosacral injury which occurred early in her life and progressing spondylosis involving cervical vertebrae. Two initial sessions—comprised of a combination of dry needling, electrical stimulation (E-stim) and laser—spaced one week apart provided substantial pain relief which lasted approximately one month. Repeated monthly sessions of dry needling, E-stim and laser seem to keep the patient comfortable. History and Presentation: Chloe is a 12-year-old spayed female miniature dachshund who was rescued at the age of 2 years. At the time of rescue, Chloe’s body score was 1/9, and she came with a history of a severe injury sustained at 8 weeks of age when a young child accidentally landed on her after jumping off a step, resulting in a 48-hour stay at an emergency facility, part of the time in oxygen. Radiographs of Chloe’s spine and pelvis taken in August 2016 showed spondylosis affecting her cervical vertebrae and the lumbosacral region. Chloe is on a maintenance dose of Tramadol 25mg BID, and Gabapentin 50mg SID. Physical Examination and Clinical Assessment: On May 4, 2017, Chloe was presented by her owner with the complaint that she was moving more slowly than normal and was reluctant to use stairs. On examination, Chloe would not freely turn her head to the left, but had good range of motion to the right. Taut bands were palpated bilaterally in the lateral neck and bilaterally from T5 to L2. Chloe had an altered gait involving her rear legs, with the right rear tracking forward in a slightly abducted plane. While there were no appreciable neurologic deficits, the nails of the 3rd and 4th digits of both rear feet were worn down almost to the toe, indicating that Chloe was not completely picking her rear feet up as she ambulated. Medical Decision Making: Chloe had trigger points in many areas. Because she had never had acupuncture, for her first session I decided to focus on her most painful region, her neck, and add other acupuncture points if she tolerated the treatment well. Differential Diagnoses: Based on Chloe’s history, earlier radiographs and physical exam, differential diagnoses included the following: cervical disc disease, muscle spasms, intervertebral disk disease, and advancing spinal arthritis. Definitive Diagnoses: Chloe’s owner declined repeat radiographs, so based on history, earlier radiographs, and physical exam, definitive diagnoses included cervical disc disease and muscle spasms. BL 15, BL 16, BL 17, BL 21, BL 23, BL 25, and Bai Hui. After all needles were removed, 5 minutes of laser treatment (using a My Pet Laser) was provided in a stroking pattern from C1 to the sacrum. At the second appointment, Chloe’s owner reported that she was more playful and was going up and down the small dog stairs leading to the owner’s sofa. Chloe still had taut bands on both sides of her neck, but would freely turn her head from side to side. Taut bands were palpated bilaterally from T13 to L5. After placing dry needles at GV 14 and Bai Hui, I provided E-stim for a total of 15 minutes in a circular pattern through 0.20x30mm SEIRIN needles placed at BL 10 and at the cervical spinal nerve trigger points at the level of C7. After all needles were removed, 5 minutes of laser treatment was provided in a stroking pattern from C1 to the sacrum. At the third appointment, Chloe’s owner reported that she did well for about a month following the second acupuncture and laser treatment session, but for the past week had become reluctant to use the stairs. Taut bands were appreciated bilaterally from T13 to the sacrum. Dry needles were placed at GV 14 and Bai Hui, and E-stim was provided for a total of 15 minutes in a circular pattern through 0.20x30mm SEIRIN needles placed at BL 21 and BL 28. After all needles were removed, 5 minutes of laser treatment was provided in a stroking pattern from T13 to the sacrum. Outcomes, Discussions, and References: In October of 2012, in an article in Archives of Internal Medicine by Andrew J. Vickers et al., the authors concluded “that acupuncture has effects over and above those of sham acupuncture [and] is therefore of major importance for clinical practice.” This was a study conducted in human patients, but it is equally applicable in pets, as the psychological aspects of sham acupuncture do not apply in animals. If acupuncture were merely a placebo, it would have virtually no effect on a non-human patient. 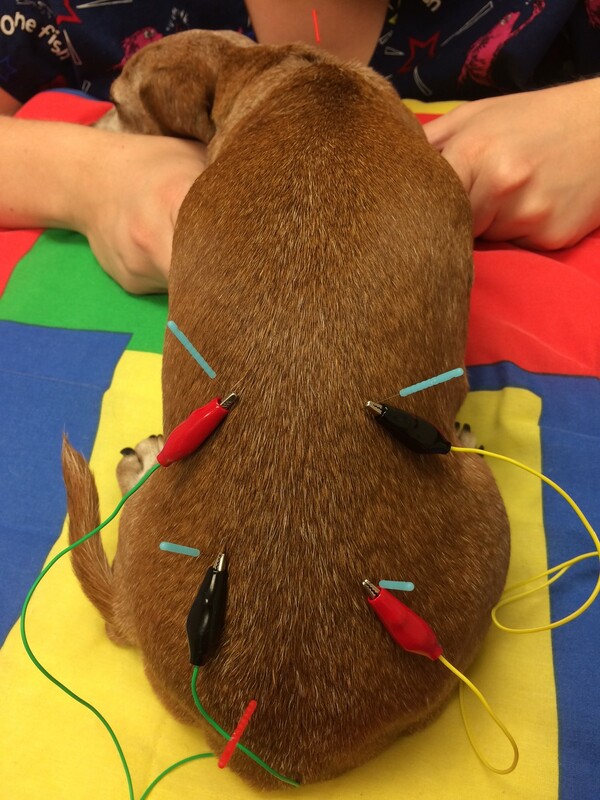 Chloe has had excellent response to acupuncture and laser treatment and is a perfect example of how effectively acupuncture can help with alleviating chronic pain. After a treatment session, Chloe has improved quality of life for approximately 1 month, as evidenced by her ability to go up and down stairs, her happier demeanor and her willingness to run and play with other dogs. (Her owner reports that Chloe is much more playful with her housemates in the weeks immediately following a therapy session.) Chloe’s maintenance medications were not changed during the course of the treatment; the only change was the addition of acupuncture sessions followed by laser treatments, so the improvement is due to acupuncture and laser. As a veterinarian, it is immensely satisfying to see the improvement in quality of life that I can give to geriatric patients through acupuncture and laser treatments. In addition, incorporating acupuncture and laser therapy into the treatment plans of hospitalized patients at our small animal emergency clinic is proving to be exciting as we witness improved patient comfort along with faster healing and recovery. We have begun offering alternative modalities to all patients who are suffering from debilitating injuries or are recovering from surgeries; the response from clients has been overwhelmingly positive. Vickers A, Cronin A, Maschino A, et al. 2012 Oct 22. Acupuncture for chronic pain: Individual patient data meta-analysis. Arch Intern Med [accessed 2017 Aug 29]; 172(19):1444-1453. doi:10.1001/archinternmed.2012.3654.